Magix Video Pro X is the top of the line video editing software from the European based Magix company and in posting a review of the program it is important to understand where it sits in the overall editing software universe..
Video Pro X is a professional grade editing and post production suite able to handle all levels file formats from consumer through to fully professional broadcast quality. So from a review perspective it is aimed at the advanced amateur through to the total professional. As such, it offers professional special effects and post production features, complete audio control and advanced color correction and grading. Pro X has a flexible user interface for a customized workflow and is optimized to produce video, image and audio at broadcast studio quality. 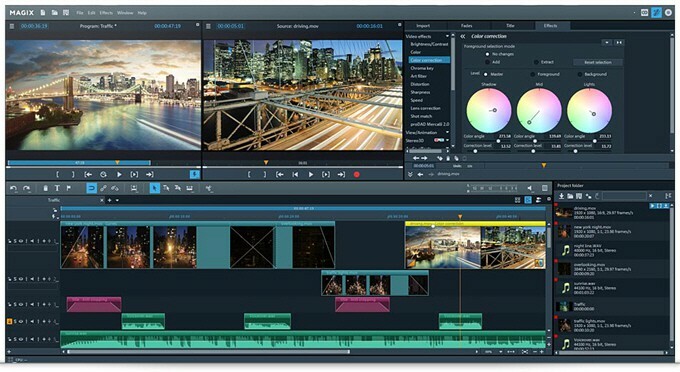 Magix Video Pro X version 8 was the final iteration of the software before they dropped their old version numbering system to adopt a less “version-centric” update cycle. These days the program is simply referred to as Magix Video pro X and instead of sandbagging updates for a year and then doing a big release, Video Pro X is updated continuously as it is developed. 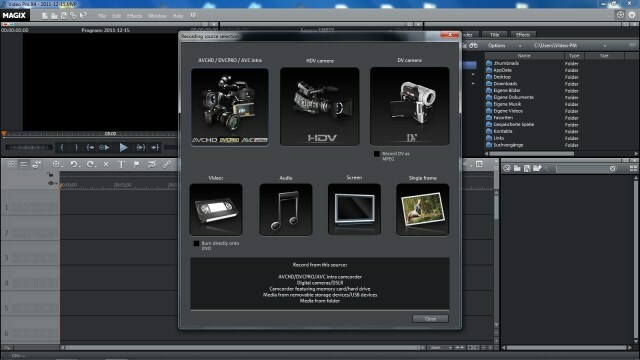 Video Pro X is now in its tenth year of that development and sits comfortable at the pro end of the scale. The program slots itself in right in the middle ground between the top consumer video editing programs and the fully professional editing market. What is notable about it is that they have set that position by price point rather than the features or capabilities on offer. 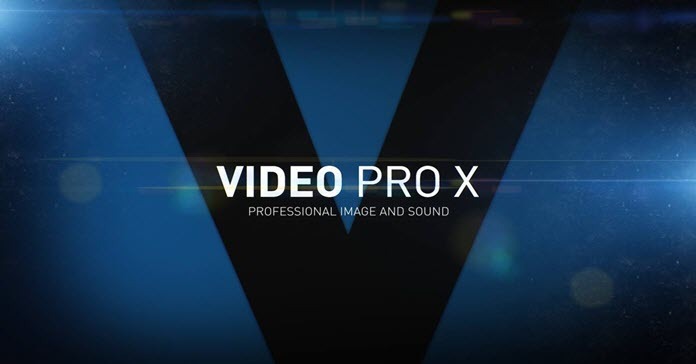 Make no mistake, Video Pro X may be priced at the lower end of the prosumer or professional video software market but it’s feature set sits up there with the best of them. Before I get into the review part of this it is important to note that this is not an average home user type of software. It is fully professional and comes with a price tag around U.S. $400. If something like this is out of your range or beyond what you have a need for then save some time and take a look HERE for more suitable consumer level editing software choices. You are wanting to get into video editing seriously and have yet to make a decision as to what video editing program you will use BUT don’t want to spend $800 – $2000 plus to find out if it is really what you want to do. You are already using a consumer level video editing program, have exhausted the possibilities there and want to step up to a professional program. You are dealing with footage from a number of separate sources and different video file formats and need a video editor that can easily handle mixed assets on the timeline. You need a video editing program with professional audio control thrown in. You have equipment that is recording broadcast file formats and need a program that can handle these demanding video assets more efficiently. You are dealing with multi-cam video editing projects and you require fast and easy control over synchronizing the separate footage from separate sources. You just want to buy a REALLY good video editing program! So before I get into full “review mode” take a look at this video to get a better feel for the software and what it can achieve. MAGIX Video Pro X is the perfect software solution for intuitive and powerful video production. Video Pro X offers a flexible user interface which allows its windows to be adjusted for your particular working situation. Both preview monitors can be resized to fit your screen or enlarged to full screen and moved to support the use of multiple monitors. Project folders, the time-line and the various media folders can be resized and moved as separate windows. Keyboard shortcuts for all menu functions can be customized as you like allowing you to adapt your existing shortcuts from whatever program you are using to remain the same in this program. This really is a time saver as you don’t have “re-learn” a whole new set of keyboard shortcuts for basic or repetitive functions. Users who have switched from Magix Movie Edit Pro can select whether they would like to work with the same workflow or with the Video Pro X workflow. You can import and edit different video formats in SD or HD resolution such as DV, HDV, or AVCHD without having to change the project settings or convert the files into an intermediate format beforehand. It supports AVCHD from camcorders and digital photo cameras allowing those video files to be imported easily into Video Pro X for further editing. The resulting projects can be burned onto AVCHD disc or Blu-ray™ and played back on Blu-ray players. Video Pro X also supports importing and editing of the professional XDCAM format as is without any requirement for upgrades or add-ons. Magix Video Pro X imports from a wide range of recording sources such as camcorders (DV, HDV, AVCHD, DVD), hard drive, memory card), webcams, TV cards, screen capturing software and USB video converters. Project files created with Magix Movie Edit Pro can be imported directly into the software for further editing. AVCHD videos can be burned onto standard blank DVDs and viewed with any conventional DVD player without having to go to the more expensive Blu-ray™system although it is supported. Export Directly to YouTube, Mobile Devices or Numerous Different Video Formats. You can make your finished productions available for viewing on cell phones, iPods or an entire range of other portable devices. In addition to Windows Media, RealMedia or QuickTime, export can also be done in MPEG-4/H.264/3GP with AMR and AAC audio. You can upload videos directly to Vimeo from within the program as well as YouTube and in the case of YouTube it can be automatically in H.264 HD resolution format to maintain the very best quality possible.